Minted in the rich colonies of Mexico and Peru since the 1500’s and transported by the famed fleets of Spanish galleons at great risk from pirates, hurricanes, and treacherous waters, the Spanish milled dollar was by far the most commonly circulated coin in the American colonies. It was so widely accepted that when the United States of America was established, it based its own currency on the milled dollar and officially sanctioned these coins until the 1850’s. The Spanish milled dollar was a silver coin with its edge “milled”, or patterned, to prevent traders from shaving silver from the edge unnoticed. 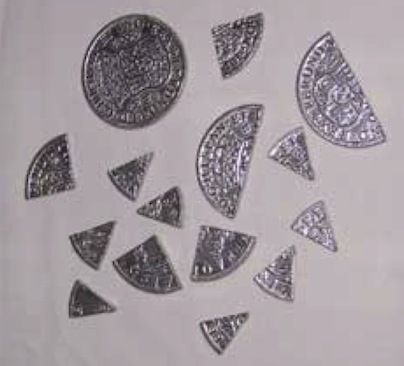 Since early coins were valued by their weight and metal content rather than at “face value” as coins are today, the bearer of the coin could make change by breaking the coin into pieces. The milled dollar is known as a Piece of 8. It was worth 8 reales, a common Spanish coin denomination. The expression “2 bits” to mean a quarter of a dollar comes from breaking the milled dollar into 8 “bits”. The British Navy patrolled the sea lanes to stop illegal trade with Spanish Louisiana and Cuba, but British colonists in North America, ignored the law. So much illicit trade with the Spanish was conducted, that Spanish silver dollars or “Pieces of Eight” were more commonly used than British coins in commerce and trade.